Netflix now has a wide variety of Korean dramas. They have some of the classics and some that were just released last year. These shows are action packed with a ton of romance. 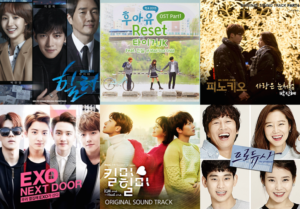 Here are 10 Korean dramas you can watch on Netflix. Plot: Bong-Soon (Park Bo-Young) was born with super strength, which is hereditary from the women’s side of the family. Bong-Soon fights evil while being in a love triangle with her boss and childhood crush. Plot: Assistant Chef Na Bong-Sun (Park Bo-Young) is really shy and timid because of her ability to see ghosts. One day one posses her, Shin Soon-Ae (Kim Seulgi). The ghost helps her build confidence to win over her crush Chef Kang Sun-Woo (Cho Jung-Seok). Plot: Yoo Shi-Jin (Song Joong-Ki) a soldier and Kang Mo-Yeon (Song Hye-Kyo) fall in love in during the chaos of war. Fun Fact: The two stars recently got married. Plot: Four different types of girls share a house while attending University. Plot: A producer (Kim Min-Kyo) gathers trainees that people consider scraps and turns them into a successful co-ed kpop group. Plot: Based on a Japanese manga, an unexpected roman between an arrogant genius (Kim Hyun-Joong) and a naive student who has bad grades (Jung So-Min). Plot: A special agent disguised as a bodyguard (Park Hae-Jin) has to protect an ill-tempered star (Park Sung-Woong). Plot: In South Korea’s most prestigious music academy, two young prodigies (Joo Won and Shim Eun-Kyung) use music as the foundation for a romantic relationship. Plot: Follows high school student Sung Shi-Won (Jung Eun-Ji) throughout the 1990s and her obsession with boyband H.O.T. Plot: Showcases cultural events that happened in 1994.